And now I can make you wait no longer to share the mouthwatering Greek Fetish Burgers. These burgers are no exception. Greek Fetish burgers are filled with salty crumbled feta, diced sweet onion, tangy sun dried tomatoes and dried oregano. I told you that they were packed with flavor. We garnished our burgers with a mesclun mix that included a little (more) feta & red peppers tossed in olive oil & red wine vinegar. And to take it a step further, topped it all with a dollop of tzatziki. Oh heavens was that a tasty mouthful. 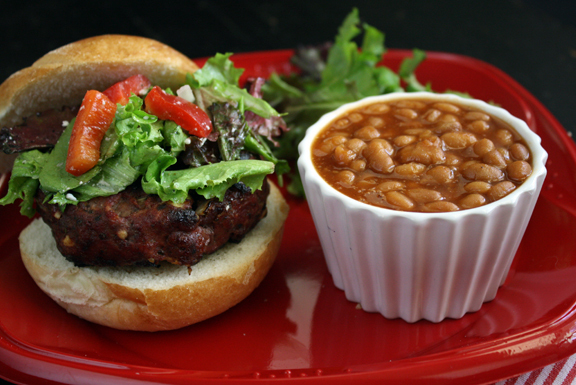 We served our burgers with some delicious Bush’s® Homestyle Baked Beans for the perfect hassle-free game day combination. 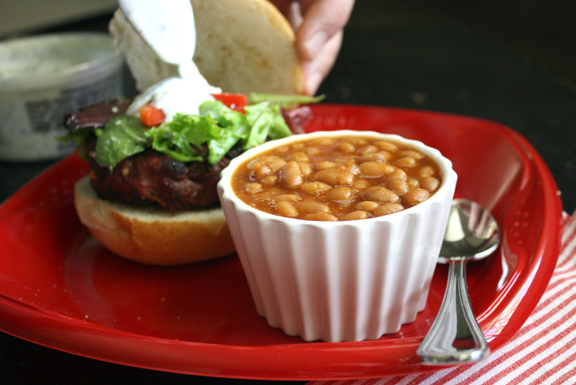 The down-home flavor of the Homestyle baked beans in a tangy sauce with specially cured bacon and brown sugar were the perfect match for My Yann’s Greek Fetish Burger. The Greek Fetish Burgers and beans filled the bellies of all the fans and made our game day tailgate a success! Be sure to make some at your next tailgate! Congratulations Joanne! I’ll be contacting you about your prize! To enter this giveaway, simply leave me a comment below telling me YOUR favorite game day food! The giveaway begins today Tuesday, October 25, 2011 and will end on Friday, October 28, 2011 at 3:00 p.m. EST and is open to all U.S. residents. One winner will be randomly selected and announced sometime Friday after 3:00 p.m. EST .Please make sure to leave a valid email address so that we can notify you about prize details! 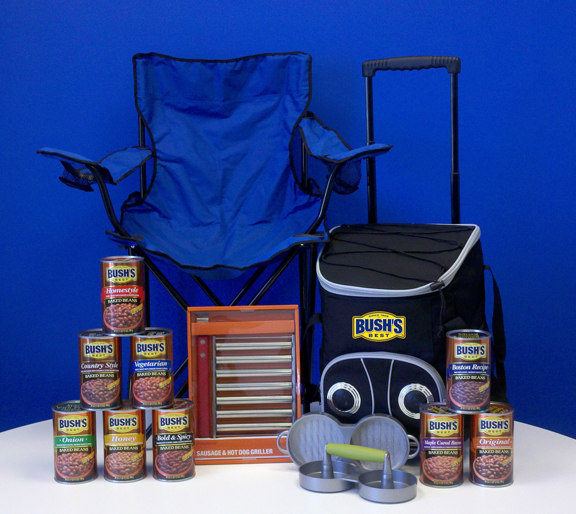 Disclaimer: The cookout and giveaway are in partnership with Bush’s Beans. However my opinions, thoughts and photos are 100% my own. Tzatziki! These burgers would be my favorite game day food if I were hanging with y’all! YUM! My favorite game day food is…hot wings!! Or wait–potato skins. Or….chips and dip? Sigh, I love it all. Thanks for the chance to win!! Your burgers look AMAZING!! My favorite game day food is boring old nachos…but OPA this burger looks incredible! Feta cheese in the burger? Yes Please!! These look fantastic, I love feta! I love me a big ole crock o’ chile!! I love all those great Greek flavors packed right into the burgers! Baked chicken fingers and baked fries…that way I don’t feel so guilty eating too many! For the cold game days, chili! For the hot days – grilled burgers and veggies. sadly, i’m still a sucker for sweets on game day. cupcakes! cookies! cakes! My favorite game day food is taco or bean dip and tortilla chips! My favorite game day food is hamburgers cooked on the grill! Those look like the most perfect burgers, ever! YUM! You definitely get an “OPA” from me. This sounds as though it is so flavorful. I LOVE feta. Last night we had chicken with quinoa with spinach, tomatoes and feta! For games, sliders are always great, but our new fall fave is roasted pumpkin nachos! I would have to agree – hamburgers – and some sort of beans, salad, and dessert. 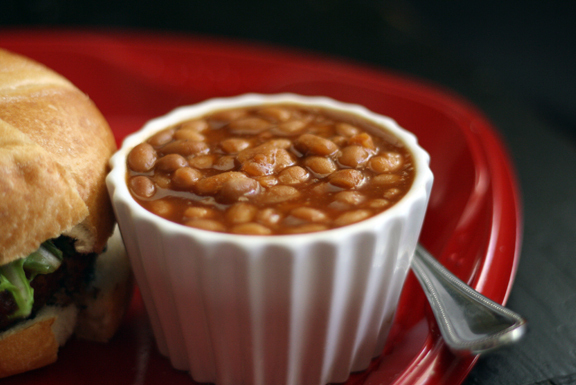 My all time favorite is burgers on the grill with baked beans in the fall time and of course a big pot of chili in the winter for game days. Awesome give away. We love to tailgate with anything Mexican (at USAFA games – go Air Force!) so our favorite tailgate food is MARGARITAS!!! O.K., I’m not entering the contest but I will confess that I think I’m developing a fetish for these hamburgers (pun intended) but they look so delicious I couldn’t help it. Love the sound of these burgers! I think chips and guac are probably my all time favorite game food. Actually, any game food is my favorite because I much prefer to enjoy the snacks rather than watch the game, lol. Favorite Game Day Food would definitely have to be bean dip with chips! Sliders all the way! You can match ’em up with multiple toppings and sides. Burgers with all the trimmings! Yum! Mmm….Nachos…but we do them with feta, olive and humus!! Yum!! Those are the most delicious burger. They tasted great with Bush’s homestyle Baked beans. game day food? I love it all! nachos, hot wings, brats…I could go on and on! 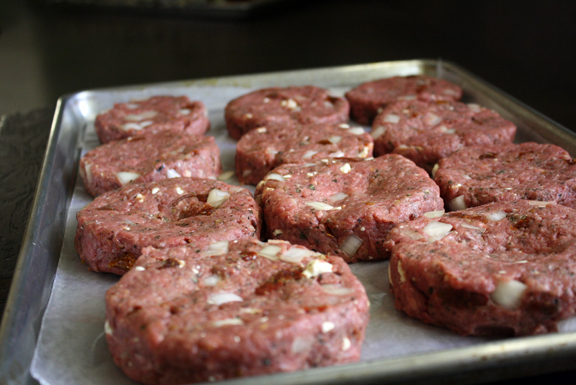 I love to make different types of burgers for gameday. The stuffed BBQ Bacon Cheeseburger is my favorite. But my tailgate is not complete without Bush’s Homestyle Baked Beans. I love the chunks of meat in there. Married my soulmate. Mama of 2. Love to inspire. Can't help but to relish in all things beautiful inside & out. Join me in Savoring the Art of Living. Stay in touch with Wenderly from your inbox. Signup to get email alerts for the latest and greatest posts.